The W7 & W8 – Nokia’s Future? 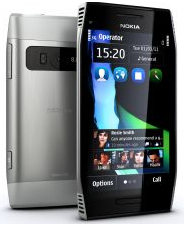 If you could travel forward in time to Halloween or Christmas you would probably arrive in time for the launch of Nokia’s first Windows Phone 7 handsets, the Nokia W7 and W8. Once there you may also feel a sense of deja vu with designs that look very similar to the Nokia X7 and N8 (after all we did mention just the other day that the design of the Nokia X7 was somewhat futuristic with concept looks). There will however be a few updates to the spec’s with the W7 promising an 8-megapixel camera with autofocus and the W8 going all out with a rumoured 12-megapixel camera and dual-core processor. There are sure to be many changes and updates along the way, so watch this space!